Really? DC Direct has NO toys this month? Just a pair of Ame-Comi repaints on page 138? White Canary and Black Flash will supposedly arrive February 1. IDW's GI Joe and Transformers comics are found between pages 150 and 153. McFarlane is listing the first series of Walking Dead TV figures on page 210, scheduled for a November release. They look nice, but remember: 5". Page 211 shows Halo anniversary singles and 3-packs. Femme Fatales Minimates Series 2 are shown on page 382. They include Medusa (a siren, actually), Anne Bonny, Little Red and Alice. Then, on page 384, we see Marvel vs. Capcom Minimates Series 2, and the page next to that has Marvel Select Colossus. There are new GI Joe figure and vehicle listings on page 387 - the art is old, but don't get confused. If you're interested in South Park figures, you should check out page 388. And it's the same page for NECA's Gremlins Series 2. 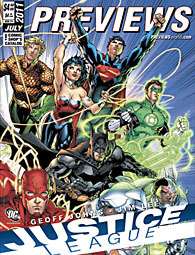 Mattel's Green Lantern Movie Masters and Young Justice figures are listed on page 391, and so are the Living Dead Dolls minifigures. I don't know if anyone actually buys Lego through previews, but it starts on page 392. There's even a Lego Star Wars character encyclopedia with an exclusive figure. Marvel Universe three-packs are shown on page 394, including the living members of the Fantastic Four, and the Guardians of the Galaxy: not the real team, but the one kicking around now. Page 396 shows both a 3¾" Dexter toy, and NECA's newest Terminator figures. Star Wars fans should turn to page 397, if only to see Savage Opress called Savage Repress. Ha! There are no real Transformers shown this month, but the Kre-O sets are listed on pages 398 and 399. Page 399 also has two sets of videogame figures: Jazwares' Mortal Kombat and NECA's Gears of War 3. Want a Stay-Puft Marshmallow Man to go with your Ghostbusters toys? Got $110 to spend? Then go to page 432 to find the 8½' tall inflatable version. At last, he'll be in-scale with the figures! And back in the dvd section, page 452 has MASK: The Complete Series available, supposedly "uncut and complete." When did they reinstate the draft? This entry was posted in Previews and tagged Ame-Comi, Fantastic Four, Ghostbusters, GI Joe, Green Lantern, Gremlins, Halo, Kre-O, Marvel Select, Marvel Universe, MASK, Minimates, Player Select, South Park, Star Wars, Terminator, Transformers, X-Men, Young Justice, zombies. Bookmark the permalink.